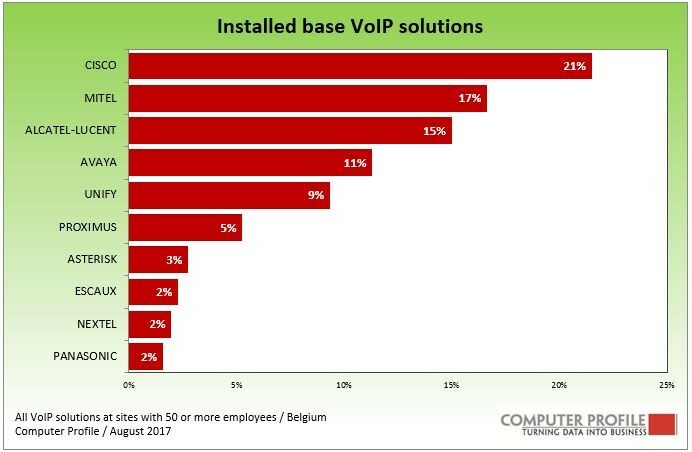 43% of all unified communications and videoconferencing solutions used on the Belgian business market involve a Microsoft solution. This represents 3% growth from the previous years, and concerns Skype for Business, formerly Microsoft Lync. Cisco, including Tandberg (acquired), accounts for ca. 25% of the solutions. The top three are rounded off by Polycom with a share of ca. 15%, chiefly videoconferencing solutions. All other vendors have a share of under 5% in the total. This and other results stem from an analysis by Smart Profile based on ca. 3,800 interviews with ICT officers from Belgian business sites with 50 or more employees, on the use of communication solutions. The regional differences between vendors are striking. For instance, Microsoft’s share in Wallonia is decidedly lower than in the Brussels-Capital Regio and in Flanders. 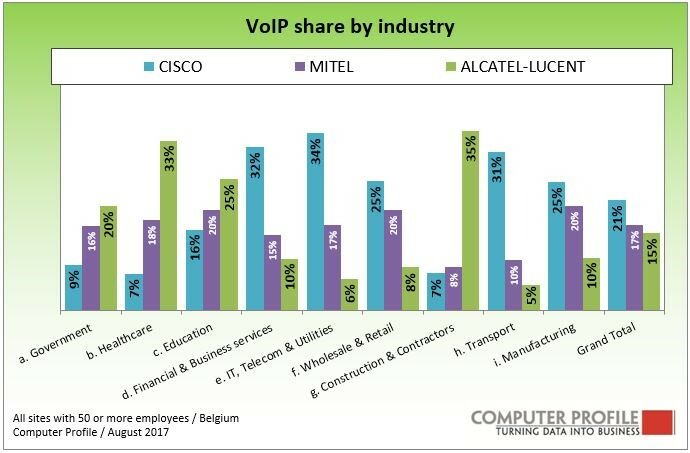 Cisco does clearly better in the Brussels-Capital Region and Polycom is most strongly represented in Wallonia. Microsoft has a large share (exceeding 65%) in the transport sector, and scores high also in ICT & Utilities and Financial and Business Services (46%). Cisco scores also well above average in the Financial & Business Services and the trade segment. Polycom comes most strongly to the fore in education. 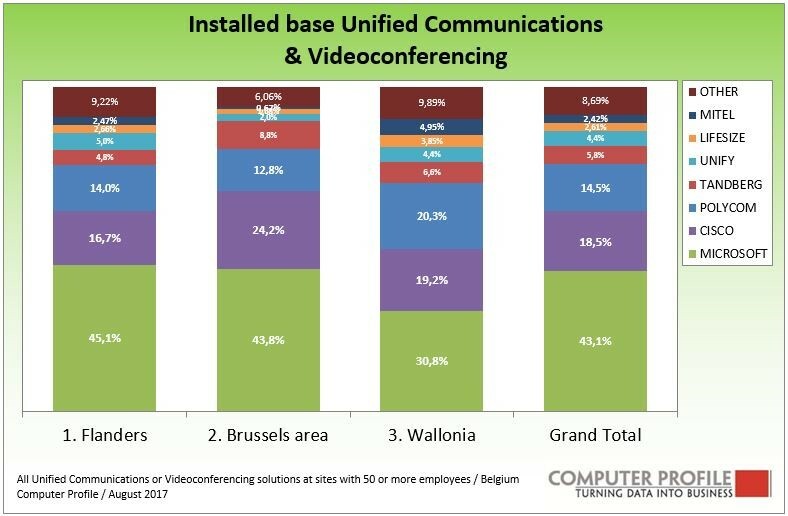 For the first time since 2011, there is no increase in the number of sites that indicate that they use unified communications and videoconferencing. In 2015, 36% of the interviewed sites indicated that they used a solution in this field. Stagnation seems to have set in – saturation in the market for unified communications and videoconferencing. Unified communications and videoconferencing are used primarily in the large business market. As of 200 employees on the site, the use increases to some 50%. For sites with 50 to 100 employees, this percentage stands at 30% and for sites with 100 to 200 employees, at 36%. At present, Cisco, Mitel and Alcatel-Lucent are the market leaders in business voice-over IP applications. Cisco seems to do particularly well in the ICT and Financial Business Services. Of all locations in the study that indicate using VoIP, more than one fifth says they do so with Cisco solutions. Mitel does well above average in education, wholesale and retail and manufacturing, with 20%. With both of these, Alcatel-Lucent stands out with ca. one third in the healthcare and the building and construction sector. Cisco is and remains the most cited name when it comes to VoIP service providers. In 2017, it had a 21% share in the total number of inventoried sites with VoIP solutions. At number 2, Mitel, from Canada, has the same share as last year (17%). Alcatel-Lucent, Avaya and Unify (Siemens Enterprise Communications), round off the top five. Proximus and Nextel were named as vendors of the purchased VoIP solutions, whereas these parties do not create their own solution. Because these service providers can supply solutions from several manufacturers, the share of Proximus and Nextel cannot be attributed to one of these manufacturers. It was therefore decided to include both service providers in the summary in order to sketch as complete a picture as possible.